The Tissue Procurement Facility (TPF) processes and banks tissue biopsies, body fluids, and buffy coats in support of clinical trials and banking protocols. 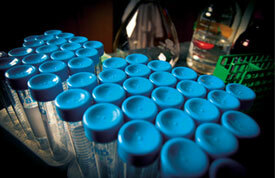 These specimens are processed in diverse ways for recovery of viable cells and storage, under cGTP conditions. Blood is processed for serum, plasma and PBMC. RNA and DNA can be isolated. Tumors can be snap-frozen, fixed, or, digested to single cells and cryopreserved or processed further. Recovered tumor cells can be used as a source of antigens for vaccine preparation, and patient samples can be de–identified for research use.